We give thanks to God for the grace-filled visit of the Holy Father to Great Britain, and especially for the Beatification of our Cardinal, John Henry Newman. Seven coaches left very early in the morning from the Oratory to go to Cofton Park for the Papal Mass. 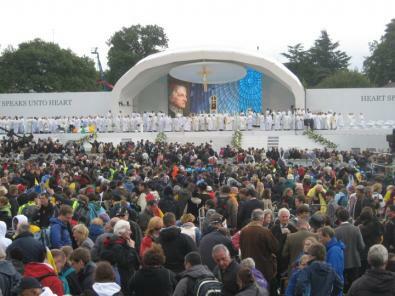 Despite rain in the early morning, the sun came out as soon as the Holy Father arrived. Newman may the first beatus whose banner was unfurled electronically. The picture is that by Ouless, which hangs in the Birmingham Oratory, and a copy of which has been used for our own shrine in Oxford. 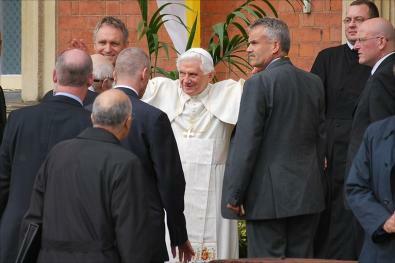 Here, Father Gregory Winterton greets Pope Benedict. 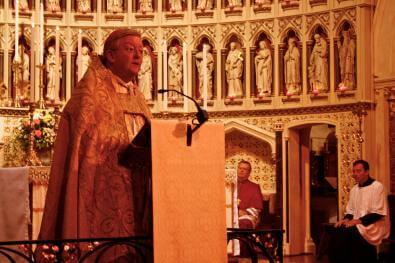 Fr Gregory was Provost of the Birmingham Oratory at the time of the foundation of the Oxford House. 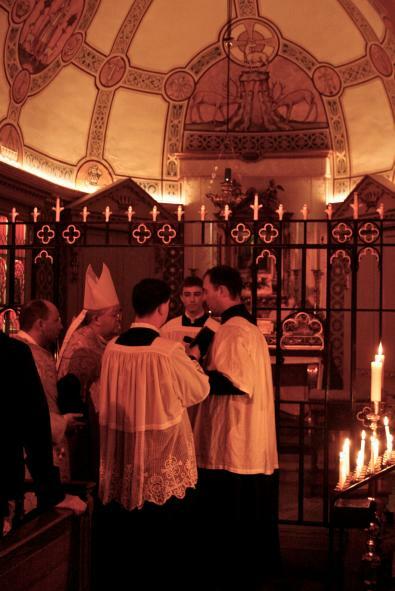 The Holy Father paid a private visit to the Birmingham Oratory. He was the first pilgrim to pray at the shrine of Blessed John Henry and went to the Cardinal's room. Pope Benedict was also delighted to meet Pushkin the cat, to whom he spoke in "cattish German"! Afterwards he greeted the large crowds who had collected on the Hagley Road. The splendid white and gold Papal hangings on the front of the house were lent by the Naples Oratory. 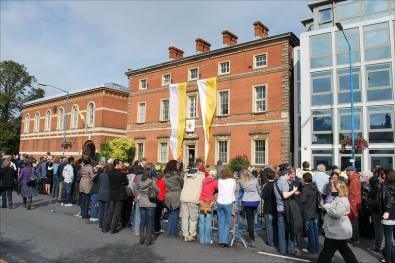 Over eighty Oratorians were present for the Beatification. 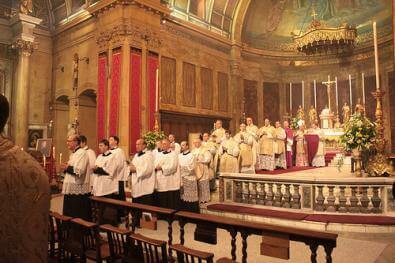 Here we see some of them at the Solemn Mass of Thanksgiving the next day. Photograph by James Bradley. 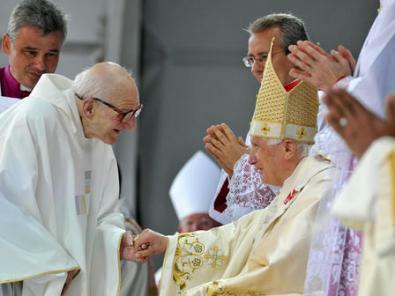 The Archbishop explained that the chalice used for the Mass was that given to the Archdiocese by Pope Benedict on Sunday. After Mass, His Grace blessed the shrine of Blessed John Henry. Eventually, we hope to build a chapel specially dedicated to our Cardinal, but the present small altar serves to focus devotion for the time being. 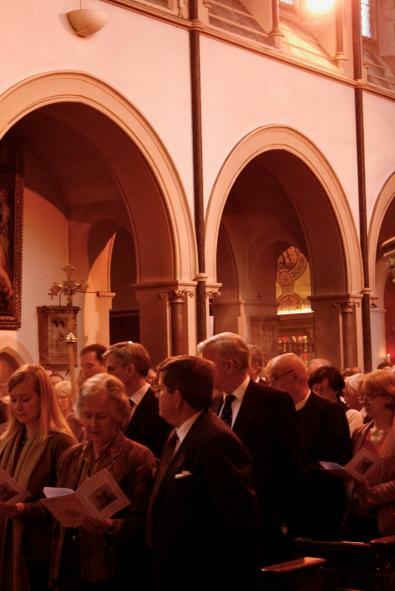 It has been wonderful to receive many pilgrims to our church over the past few days; from the United States, Poland, Austria, France, Italy, Germany, Belarus, Canada, Japan, South Africa, Ireland, Spain, Argentina and many other places.